20 March 2019: The President of Puntland State Hon. 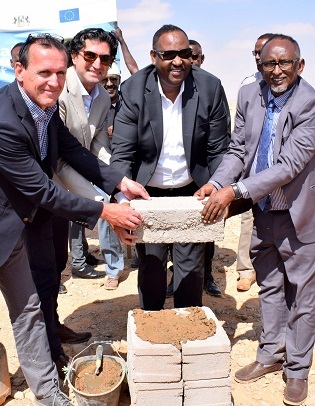 Said Abdullahi Deni inaugurated the site and laid a foundation stone for the construction of the Information Management Center (IMC) along with EU representative Mr Martino Vinci and FAO Deputy Country Representative Mr. Etienne Peterschmitt. The IMC center is intended to be a center with resources and capacity to provide timely and accurate information for the management of water and land resources in Puntland. The government of Puntland donated the Land on which the IMC center will be constructed as an in-kind contribution to the ILWRM Project, which is funded by EU and implemented by FAO SWALIM. The launch came a day after consultations involving the EU, FAO SWALIM and the line ministries. Speaking at the event, president Deni expressed his joy highlighting the importance of the center in providing timely, accurate updates to sustainably manage crucial land & water resources for the people of Puntland. The EU Delegation to the Federal Republic of Somalia jointly with the Government of Puntland and the Food and Agriculture Organization of the United Nations (FAO) had launched the Integrated Land and Water Resources Management (ILWRM) Project in Garowe on 19 March 2019. The Ministry of Planning coordinated the event, which was attended by representatives from the Ministry of Environment and Agriculture, Ministry of Livestock; Ministry of Water and the Agency for Disaster Management (HADMA) as well as other Somali and International partners and stakeholders. The partners seek to strengthen the capacity of all responsible Government institutions creating a centralized Information Management Centre (IMC) able to provide all the information and services required to design strategies, plans, and infrastructures to improve access to water and sustainable use of land resources, especially for rural pastoral and agri-pastoral communities. Water and land are critical resources for the Somali economy and people’s livelihoods but are also extremely vulnerable to natural disasters and climate change. While access to water needs to increase, required infrastructures are to be designed and managed in a sustainable way based on adequate plans and information. The projects builds on the expertise and information accumulated during over 15 years by FAO Somalia Water and Land Information Management (SWALIM) programme and will create the conditions for a progressive transfer of capacity and responsibility to the Government. “ILWRM project work as a pilot for further expansion the whole Country” expressed Mr. Etienne Peterschmitt, Head of Programme and Deputy FAO Somalia Representative. The Minister of Planning Hon. Abdiqaafar Elmi appreciated the support from EU and the partnership with FAO, highlighting the importance of the project to improve access to water for local communities in a context like Puntland constantly affected by drought and where natural resources are scarce and progressively deteriorating. ILWRM, with an overall EU contribution of 3.2 millions Euro, is shared with Somaliland, where the same activities to be implemented in Puntland are foreseen, including a pilot project to be designed and implemented by the IMC in collaboration with local communities in a selected water catchment.